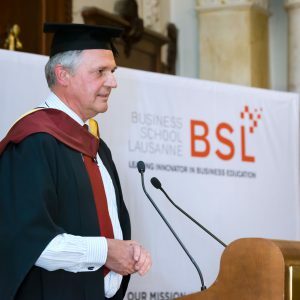 Paul Polman, CEO of Unilever, received BSL’s 2014 Honorary Degree in recognition of his exceptional contribution to putting sustainability at the core of the corporate world. Paul Polman has been Chief Executive Officer since 1st January 2009. Under his leadership Unilever has set out an ambitious vision to double its size while reducing its overall environmental footprint and increasing its positive social impact. Paul is Chairman of the World Business Council for Sustainable Development, a member of the International Business Council of the World Economic Forum and serves on the Board of the UN Global Compact. He is also on the Board of the Global Consumer Goods Forum. At the invitation of the UN Secretary General, he recently served on the High Level Panel of Eminent Persons looking at the Post 2015 Development Agenda and previously acted as co-chairman of the B20 group of companies reporting to the G20 on Food Security. In addition, Paul moderated BSL’s Business for Society Forum on “Switzerland as a Global Sustainability Hub” which preceded the Graduation Ceremony. The forum included panelists Dr. Katrin Muff, Dean of Business School Lausanne, Nick Beglinger, President of swisscleantech, Jean Laville, Deputy CEO of Swiss Sustainable Finance, and Bruno Oberle, Director of the Federal Office of the Environment (FOEN). The forum followed a strategic meeting held earlier the same day in Lausanne (20 September 2014) where a dozen thought leaders from all disciplines and sectors gathered to discuss perspectives on a new vision for Switzerland and a coalition supporting the idea of a Swiss Sustainability Hub. The premise of the hub, which would function as an inter-institutional space, is that the world and Switzerland need a step-change. What has been achieved to date is important and impressive but by far not sufficient to get us on track for a world where “all people can live well and within the limits of the planet” (WBCSD). Switzerland, in dire need for a new identity given its current banking crisis, with its deep ecological roots, social values and international reputation, may well have a unique opportunity to re-orient its innovation power around the notion of sustainability – to balance economic, environmental and social needs in such a way that Switzerland would one day be celebrated for contributing to a better world.